What Toys Should I Get My Hamster? What toys should I get my hamster? While the subject of “play” is supposed to be a fun and light-hearted one, this is a question that causes concern for the conscientious pet owner. You want to choose playthings that will amuse and entertain your precious hammy, while not in any way frustrating or even endangering them. We’ve researched the issue to offer you some important guidelines and a few recommendations. Since the possibilities for hamster toys might seem endless or even overwhelming, would you like some basic guidelines and essential guidance in regards to choosing the perfect toys for your furry friends? Toys that will be both safe and fun, easy to play with and easy to store? 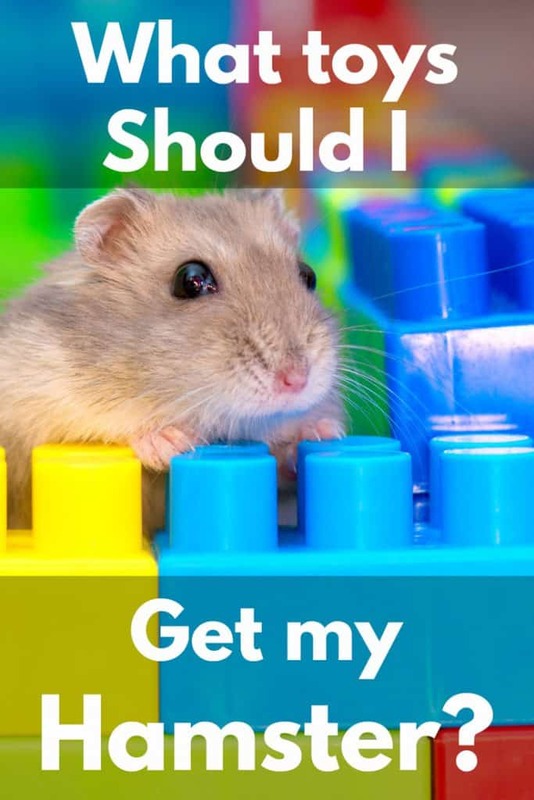 Read on now for some key tips and tricks on how to choose the perfect toys for your hamster, for virtually all species of hamsters, including Syrian, dwarf/Roborovski and Siberian.…. Why Do Hamsters Need Toys? Well, why did you need toys as a child? Was it, perhaps, to keep you entertained and out of trouble? This is precisely the same reason that you need to grace your hammy with their very own toy chest. Ah, but that’s not the only and most important reason that your pet needs play toys. Others include…. A hamster wheel, for example, is a surefire exerciser that encourages hamsters to run fast and free in a contained environment; building their bodies and boosting their fitness levels in the process. Chew toys, meanwhile, can fortify a hamster’s dental health. If your hamster is playing along happily with an approved toy, then they are not toying instead with forbidden items, ranging from electrical sockets to random pieces of scrapped plastic to bits of human food. And they won’t be as likely to bother the family pet or make off with their toys. Fido will appreciate…. So you are in possession of a brand new hammy and–well–you get the idea that he/she does not particularly like or trust you–not yet, anyway. Great feeling, isn’t it? Well, if your hamster cowers or hides from you, or if they resist any and all efforts to pet or cuddle them, then it may be because they simply need to familiarize themselves with you, your family, and your home. So if you wish to ingratiate yourself to your petulant pet, you may be able to win them over via a shiny new toy–or several! And throughout the course of your relationship, always make time to play with your hammies; throwing balls, rolling wheels and tossing chew toys in their general direction. Once your hamster learns to see you as a prime playmate, your relationship is sure to improve. The right toys will amuse, excite and placate your pet. You will rejoice in the sight of your beloved hamster chirping and jumping about when they see a certain toy, further demonstrating their enthusiasm when they grasp and embrace the toy to them. Happy hammy, happy lifey—or something like that. 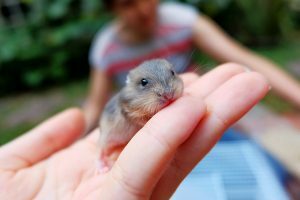 If you seek to reward your hamster for good behavior (or on the off chance that they perform a heroic hammy deed of some type–hey, it’s possible! ), then both toys and treats should suffice. Yet what does constitute ‘the right toys’ for your hamster? Read on for some answers…. What are the Best Active Toys for Most Hamsters? These plastic balls basically amount to circular running pens for hamsters; allowing them to run in circles to their hearts’ content without roaming the house or ultimately escaping. Easy to open and close, these Run-About balls are a favorite among hamsters and hamster owners alike. A classically designed Run-About toy, this safe and in all ways secure ball comes in a variety of vibrant colors and a perfectly round shape. Your hammy will enjoy hours of fun as he/she runs to his/her heart’s content, getting needed exercise in an airy and spacious exercise ball that will never limit or confine them. 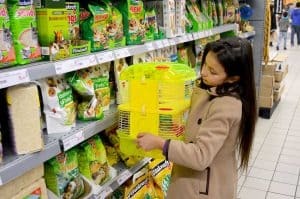 At the same time, the hamster will remain exactly where you can see them, with no possibility of escaping to the outside. Perhaps the most classic and recognizable of hamster toys, these circular wooden wheels are seen as fixtures in the cages of many hamsters. Just be certain that your hamster’s wheel is large and solid enough to handle your hammy! Likening plates in appearance, the wheel roller sits in its own holder and provides a smooth, round surface for hammies to run and jog across at will. This highly recommended hamster running wheel boasts a solid, safe and smooth running surface, with textured running tracks to ensure ‘no slip’ protection. This sublime exercise wheel, created sans a central axle to eliminate the risk of fur or tail entanglement, does come with a cage attachment; a gold-hued covering that can enclose the wheel, thus further ensuring the safety of your beloved pet. What Are the Best Chew Toys for Hamsters? The sturdy, all-natural element known as wood is a key ingredient in the creation of a hamster’s chew toy; just ensure that your hammy’s wooden chew toy has not been treated with chemicals or pesticides. This single package offers a full 300 grams of genuine, all natural apple tree sticks that will both nourish your hamster by strengthening his/her teeth, and please him/her endlessly with their sweet taste. These sturdy, 6 inch long sticks are untreated by pesticides. Soft, crunchy loofah pieces supply a softer and more flexible variation on the chew toy concept, one that hamsters even can use to floss their teeth. Shining in their full range of vibrant rainbow-hued colors, loofah chew toys also vary greatly in design; with some of the toys likening the loofahs that humans use in the shower, and others fashioned to resemble foods that range from carrots to cheeseburgers. Yes, cheeseburgers. Just as hamsters typically love to chew grass, they often enjoy gnawing away at thick, sturdy woven grass balls. This all natural treat is also one that hammies love to roll around the floor of their cage or playpen. What Are the Largest Toys for Hamsters? A large-scale hammy playground structure can actually be held in two human hands; yet the capacity for fun offered in the confines of these multi-level, multi-functional structures is very big indeed. A typical hamster playground or playhouse is a spacious maze of slides, tunnels, entry and exit holes, and plenty of room to run and frolic. Alternately, a smaller but equally enjoyable hamster playground structure might consist of a swing set and/or slide with a handy ladder attached. Hamster playgrounds are typically culled from wood or plastic. If made from plastic, just be sure that your hamster doesn’t chew or bite off any part of the playhouse. This literal animal house just may be the ultimate playhouse for your hamster. This multi-level wooden structure is a vast enclosed menagerie of bridges, tunnels, and plenty of enclosed spaces to facilitate the Three Hammy R’s (rest, recreation and running!). Described as a virtual entertainment center for small animals, the animal house more than fits the bill. Available in various lengths, wooden hamster bridges also make for good running and walking toys. Some of them even can span the length of cages. They also are available in various forms, ranging from soft and flexible rope suspension bridges that may run across the cages to solid, stationary wooden bridges that might take the shape of an arch and be placed on the floor of the hamster cage. This long and flexible suspension bridge is something of a hamster’s dream, with its impressive length and its all natural, untreated wood. This bridge can be hung with ease from both sides in any hammy cage or pen, and can be gnawed and run upon with equal energy and fervor. Continuing the theme of hamsters who just can’t get enough of running, we now offer you tunnels; round enclosed tubes of various lengths. Just be sure that your tunnel of choice is long and wide enough for your particular pet. A tunnel can take a wide variety of forms, ranging from a very basic cardboard tube to a piece of hollowed out wooden tree branch–or, alternately, a sampling of wood fashioned to resemble a tree branch found in nature. This bright and vibrant tunnel set contains 16 pieces ranging from 1.75-inch to 10-inches in size, and possessing various shapes and colors. Universally connectable, these tunnels can be used individually or joined together to create a fun tunnel network or trail for your hamster. Can I Make My Own Hamster Toys? Create a tunnel from cardboard tube, perhaps one that once held a roll of paper towels or bathroom issue. Morph a fruit tree branch taken from your yard into a chew toy; providing, of course, that the tree has not been treated with chemicals or pesticides of any kind. Make a simple box of sand. Now even the least crafty and tactile folks among us can manage that much. And as it happens, hamsters love to dig and burrow in their special sand. Morph a hollowed, empty coconut shell, or a half shell of this variety, into a fun playhouse or a running wheel. How Do I Know Which Toys My Hamster Counts Among Their Favorites? Your hamster is likely to reach for—or run through—some toys far more frequently than others. Monitor his/her behavior to determine as to which specific playthings they tend to favor. In this way, you can make informed toy-buying decisions in the future, to avoid purchasing useless objects that would simply take up space in the corner of the cage. If your hamster chirps or squeals when playing with certain toys, then this is a sure sign that they prefer these particular playthings! If your hamster sits quietly for long periods of time and plays with certain toys, then chances are they are interested in and captivated by these particular playtoys–to the extent, in fact, that they are enabling you to enjoy a little well-earned peace and quiet. These may be your particular favorite hamster toys, if nothing else! How Do I Store My Hamsters’ Toys? In order to preserve the state and quality of your hamsters’ prized playthings, you, of course, want to be cautious about their storage; ensuring not only that your hammy will be able to keep their toys longer, but that they–and you–will be able to find them with ease. Here are some practical and fun ideas for storing your hamsters’ recreational collectibles (hey, we were just trying to think of another descriptive phrase to use, besides toys and playthings). Yep, Folks, hammies actually have their own playpens now. Frequently culled from wire and lined with pads, these small enclosed pens are the perfect place to store toys, as well as the ideal means to transport their favorite toys on trips and to the vets. Practical but colorful, this 36-inch in diameter circular playpen shines in every hue of the rainbow and stands in a flawless circular shape; allowing your hamster plenty of room to run and play–and even more room to store plenty of primo hammy toys. As an added bonus, this playpen is easy to fold and store, and even easier to take on trips! Whether you choose to keep your pet’s playthings in a basic cardboard box–either open or with a covering lid–a fancy painted wooden chest with hinges, or anything in between, a box is an ideal storage unit for hamster toys. You can keep your hammy’s toy box in or near its cage, or (if you wish for your hamsters to limit their playtimes) in a nearby pantry, rec room, or pet supply closet. 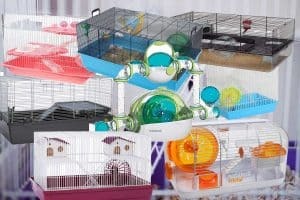 The basic answer to the question, “What toys should I get my hamster?” is never a simple one to answer, as—like all animals and even children—every individual hammy prefers different playthings. Some like balls, others like chew toys; some like to run endlessly through mazes and down slides, and others simply love to run endlessly in circles. And endlessly. And endlessly. You shop for hamster toys in much the same way that you would seek out toys for a baby or toddler; with serious attention given to the safety and sound structure of each prospective plaything. A few even like dolls. Yes, dolls. When it comes to choosing just the right toys for your pets (warning: terrible pun coming), don’t play around; find the safest and most enjoyable playthings for your hamsters! Your hammy will thank ye!